From its beginning, Bennington Museum has collected documents, objects, and art that reflect the region’s, and state’s, rich history. This continues today. However, over the past ten years the Museum has taken a new look at more recent works created by regional artists which has allowed the Museum and its visitors to further explore the rich history of Bennington and Vermont. Many of these works have found their way into the Museum’s collection and are included in the opening exhibitions for 2019. Join us on Saturday, February 2 when admission to Bennington Museum is FREE for everyone from 10:00 am to 5:00 pm. Visit all the new exhibitions and possibly interact with some of the student artists who are invited to come in and pick-up their Certificate of Participation in the 2019 Annual Student Art Exhibition. Opening in the Works on Paper Gallery is Works on Paper: A Decade of Collecting, on view through May 5. Bennington Museum has always collected works on paper, with a focus on historic materials. Recently, a greater focus has been placed on 20th-century and contemporary material. Now in the fifth season of our Works on Paper Gallery, we celebrate with an exhibition that features a disparate body of works, from historic to contemporary and self-taught works, to creations by Bennington Modernists. Artists represented include Gayleen Aiken, Milton Avery, Wilson “Snowflake” Bentley, Paul Feeley, Luigi Lucioni, Duane Michals, and Norman Rockwell. “It’s really my goal to highlight the diversity of our collections and collecting practices in this show,” states curator Jamie Franklin. A small yet captivating exhibition titled Vermont Folk Sculpture: Recent Acquisition is on view in the John T. Harrison, Jr. Orientation Gallery. This exhibition highlights the recent acquisition of a Carved Corner Post, c. 1900 created by Russell Risley (1842-1927) of Kirby, Vermont. 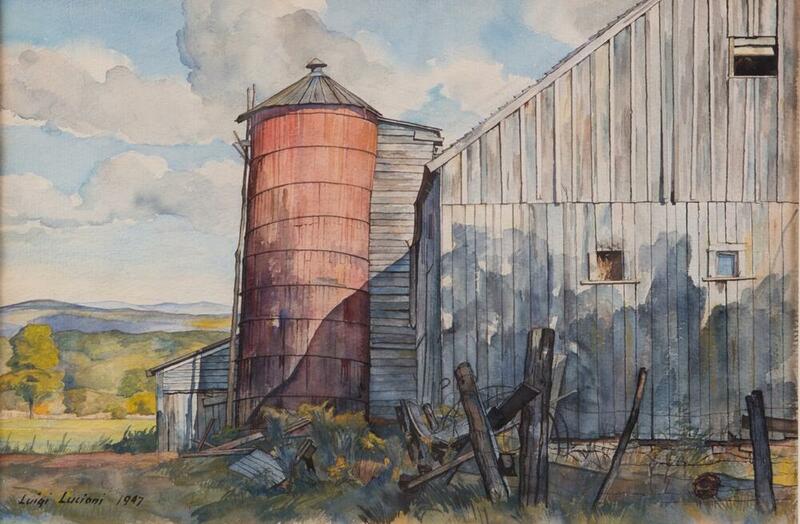 Risley spent his entire life on his family’s farm where he went about painting on the walls of the house – inside and outside – as well as the out buildings such as the barn. He also carved fence posts, rock, and blocks of wood. The Carved Corner Post is one of the Museum’s newest acquisitions which was purchased with the assistance of Lyman Orton. This work is accompanied by other iconic examples of sculpture created by individuals from Vermont who worked in popular vernacular traditions. Featured in the Regional Artists Gallery through May 27 is The Mind’s Eye: Paintings, Sculpture, and Books by Paul Katz. This exhibition features a variety of works, including paintings, sculpture and drawing books, mainly from Katz’s Prelude and Interlock series. 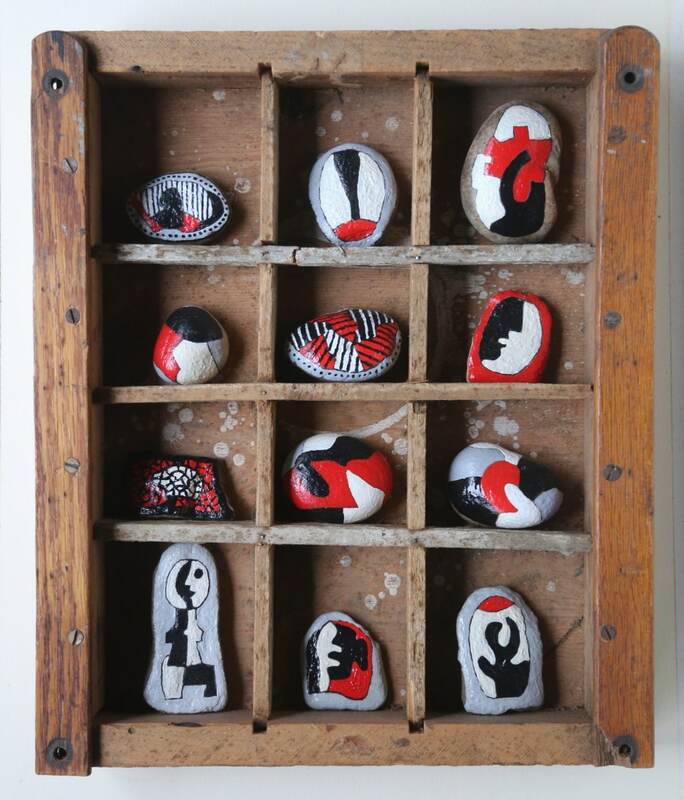 The Preludes includes paintings and everyday found objects with words painted on them as if on intertwined ribbons. The words are all taken from Henry Wordsworth’s poem “Prelude.” The look of the work was inspired in part by a photograph Katz saw in The New York Times™ in the days following 9/11. The image was of an office in which everything was covered by grey ash so that ordinary things like desks and computers took on the aspect of an ancient site exhumed. “As I have worked on my “Prelude” project, I have come increasingly able to see it as something as nearly post-apocalyptic as that photograph but with culture, itself, in the form of poetry settling like ash over everything. The dense patterns of lines and letters that cover all my surfaces make the actual poem impossible to read but I feel that I honor it, nevertheless, through an act of penitential diligence,” stated the artist. Of course the kickoff for 2019 would not be complete without the Annual Student Art Exhibition on view through March 12. Celebrating the art created by students in public and private schools in Bennington and surrounding communities, this annual exhibition explores the artistic development of students as it presents artwork of the region’s elementary, middle and high school students. The exhibition displays work ranging from whimsical projects by the young students to more advanced work of older students. Ceramic work, paper sculptures, and more complement collage, pastels, and pen and ink drawings. In the Early Vermont Gallery explore the installation of Miniatures and Small Portraits from the Museum’s collection dating back to the American Revolution. Featured in this display is a framed tintype of a painting of Lt. Jonathan Holton, a soldier in the Battle of Bennington. A Lieutenant of the Nichols Regiment, Holton was wounded at Bennington on August 16, 1777. His wound is visible in the portrait also on view. March 30-June 11 – Up Home: Hand-Colored Photographs by Susanne and Neil Rappaport Minnie Griswold died in 1952, at which time her sons locked up their mother’s house in Pawlet, Vermont and left all her belongings in place, untouched, unaltered. Thirty years later, Pawlet documentarians Susanne and Neil Rappaport were invited by Charlie, one of Minnie’s sons, now 85 years old, into the home, and went on to produce a collection of hand-colored photographs of Minnie’s home. This exhibition brings together the best in documentary work and artistic expression. Bennington Museum is located at 75 Main Street (Route 9), Bennington, in The Shires of Vermont. Beginning February 1, the museum is open 10 am to 5 pm Thursday through Tuesday, closed Wednesday through May. Open daily June through October (closed July 4.) It is wheelchair accessible. Regular admission is $10 for adults, $9 for seniors and students over 18. Admission is never charged for younger students, museum members, or to visit the museum shop. Visit the museum’s website www.benningtonmuseum.org or call 802-447-1571 for more information.